Delta Center/MDNHA team members (left to right) Sarah Hicks, Dr. Rolando Herts, Lee Aylward, Shelia Winters, and Keith Johnson at Visit Mississippi’s Juke Joint Tent, Chicago Blues Festival. The Delta Center at Delta State and the Mississippi Delta National Heritage Area partnered with Visit Mississippi to promote cultural heritage tourism to the region and state at the 2018 Chicago Blues Festival. Team members Dr. Rolando Herts, Lee Aylward, Shelia Winters, and Sarah Hicks worked with volunteers from Visit Mississippi and other state tourism and arts organizations to share Mississippi’s rich cultural assets. 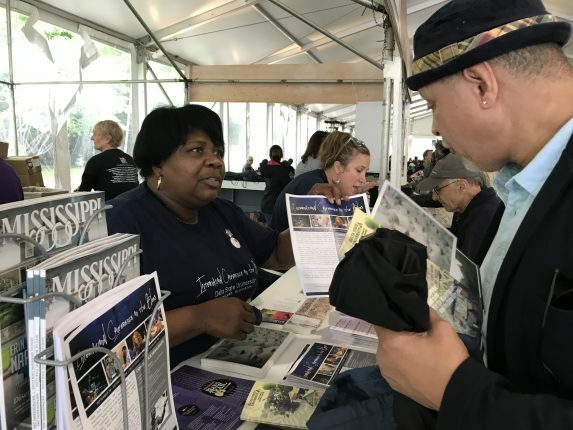 The team distributed 6,000 tourism information bags to Blues enthusiasts that packed the Visit Mississippi Juke Joint Tent to hear a variety of performers including Eddie Cotton, Jr., Ms. Jody, and International Blues Challenge winners Keeshea Pratt and Mr. Sipp. “By participating in the Chicago Blues Festival with Visit Mississippi, our team had a unique opportunity to generate interest in the International Conference on the Blues at Delta State, as well as other events and attractions here in the Mississippi Delta National Heritage Area,” said Dr. Herts, director of The Delta Center. The team interacted with travelers from across the United States and from countries around the world including Thailand, France, Russia, Saudi Arabia, Brazil, Colombia, England, Canada, and several others. Former participants in The Delta Center’s NEH Most Southern Place on Earth Institute who live in the Chicagoland area also stopped by the Visit Mississippi Juke Joint Tent to say hello. Dr. Rolando Herts and Lee Aylward with NEH Most Southern Place on Earth Institute alums Nan Cohen Stein (middle left) and Michael Ellery (far right). “People were standing in the rain to listen to the Delta Blues,” said Delta State graduate student Keith Johnson, who works in The Delta Center and performed at the event. The team also promoted Johnson’s involvement in the upcoming International Conference on the Blues. Johnson is the great nephew of Muddy Waters, whose life, work, and family will be honored at the conference. “I kept hearing that the Mississippi booth is a favorite booth at the festival, and so many people said that they plan to travel to the Mississippi Delta and to the conference now because of the information that we were able to share with them,” said Hicks, MDNHA program manager. The Fifth International Conference for the Blues is scheduled for Sunday, September 30 – Tuesday, October 2 at Delta State. For more information, visit www.internationaldeltabluesproject.com/conference/. The mission of The Delta Center for Culture and Learning is to promote greater understanding of Mississippi Delta culture and history and its significance to the world through education, partnerships and community engagement. The Delta Center serves as the management entity of the MDNHA and is the home of the International Delta Blues Project and the National Endowment for the Humanities “Most Southern Place on Earth” workshops. For more information, visit http://deltacenterdsu.com/. Delta Center team members Shelia Winters and Sarah Hicks distributing information about the International Conference on the Blues and other MDNHA events and attractions. The Mississippi Delta National Heritage Area is a cultural heritage partnership between the people of the Mississippi Delta and the National Park Service. It includes 18 counties that contain land located in the alluvial floodplain of the Mississippi Delta: Bolivar, Carroll, Coahoma, DeSoto, Holmes, Humphreys, Issaquena, Leflore, Panola, Quitman, Sharkey, Sunflower, Tallahatchie, Tate, Tunica, Warren, Washington and Yazoo. The MDNHA was designated by U.S. Congress in 2009 and is governed by a board of directors representing agencies and organizations defined in the congressional legislation. More information about the MDNHA, including the complete approved management plan, is available at www.msdeltaheritage.com.